A sofa explores the concept of "dirty" in a social format. 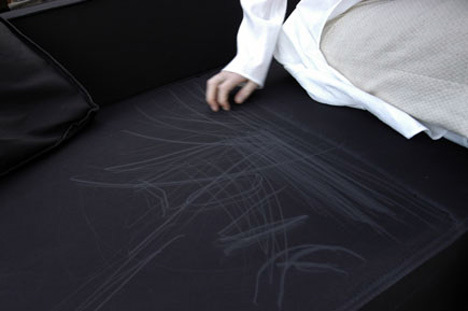 Users can make marks on the sofa that build on each other or easily be ironed out of existence. The "graffiti sofa" was created by Teruhiro Yanagihara to show scratch marks. The concept may be more revealing than intended depending on what your usual activities are on sofas. However, given the intentionally "dirty" design, it may be a more effective way of leaving a message for a lover than a steamy mirror.